Release Week starts here on the blog in just under 7 hours! The party starts with 3 days of previews and samples from the Wplus9 Design Team. You'll find tons of inspiration using all of the new products before we release them for sale. On the fourth day we will show you all of the products we will be releasing this month. And on December 5th all of the items we will be showing you will be available at www.wplus9.com, as well as at many of your favorite craft supply retailers. 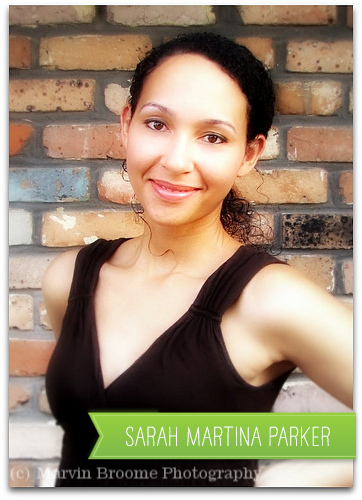 Speaking of the design team, I am so happy to announce that Mrs. Sarah Martina Parker will be joining the Wplus9 Design Team! I first asked Sarah to join the Wplus9 Design Team over two years ago, however the timing just wasn't right. I am so excited to finally have her joining the team as I think she has so much to offer! I am a huge fan of her work and look forward to seeing her work her magic with our product! Please join me in welcoming her to the team! I hope you are as excited as we are. We can't wait to share with you what we've been up to. See you in a few! As promised, I wanted to follow up with our progress on the Cyber Monday Sale corrections. We apologize for any confusion that our oversight and mis-messaging may have caused. All affected orders have been corrected and subsequent refunds have been issued. Again, only orders placed before 12:20 p.m. EST were affected. All orders have been double checked and any necessary refunds have been issued. Thank you all so much for your support and understanding. We truly appreciate your business! There was an error on our Cyber Monday Sale announcement. Although the advertisement graphic was correct, the words "up to" were erroneously omitted in the sale details here on the blog as well as the Recent News announcement on the website. The verbiage was corrected at approximately 11:00 a.m. this morning. However, we take full responsibility for the error and we will be honoring the full 20% discount on all previously released dies. All affected orders placed between 11:30 p.m. November 25th and 12:20 p.m. November 26th will be adjusted and refunded the 10% difference on qualifying dies. All orders placed after 12:20 p.m. will automatically receive the originally advertised 20% discount on previously released dies as well. We will post a follow up when all refunds have been completed. We apologize for the confusion and appreciate your business. 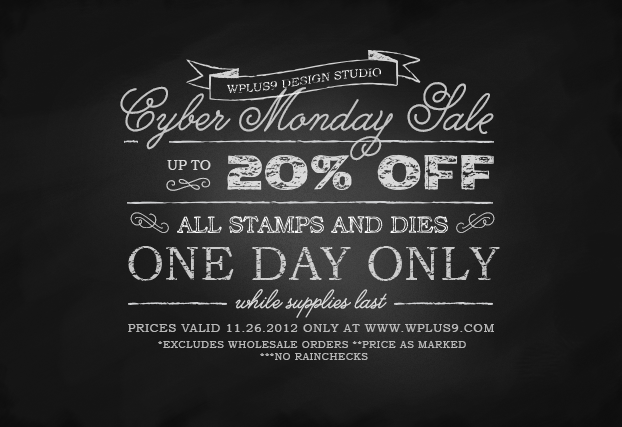 If you follow us on Facebook, then you already know that we are having a Cyber Monday Sale at Wplus9 Design! It's time to take advantage of our already low prices and pick up some of those things on your wish list for a steal! Have you started Christmas decorating yet? Traditionally we wait until the day after Thanksgiving to put up our Christmas decor. However, this year we have company arriving on Friday. So I'm using that as an excuse to decorate early. Yeah, an extra week of Christmas!! As promised, I'm back with the video on creating glittered ornaments I showed you in our Holiday Idea Mini-book. 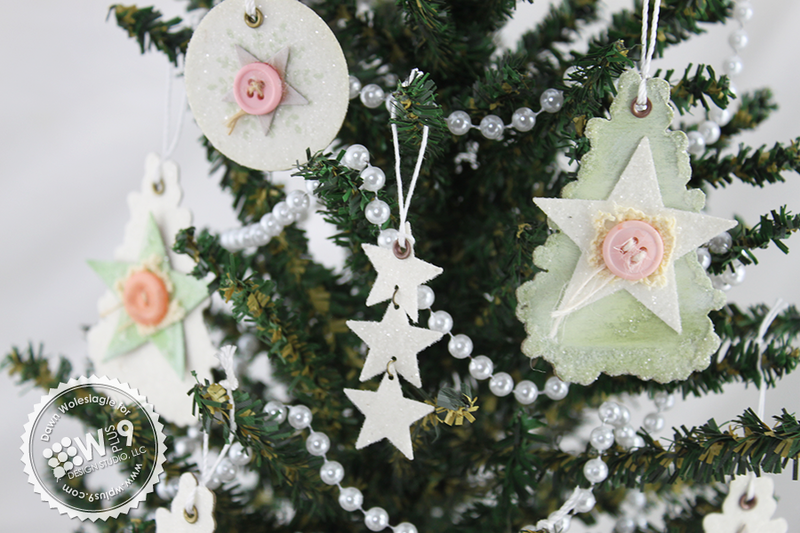 These are perfect for decorating those table top trees. And since we are using supplies that are most likely on hand and/or scraps, you can change it up each year to match your decor at little to no cost. These look amazing in all colors, but there is just something about the white glittered tree that grabs me. You can watch below to see how easy these are to re-create. I'm not usually a fan of working with glitter, but the Be Creative Tape Sheets along with the wide mouth on the Tim Holtz Glitter jar, make these ornaments surprisingly neat and painless. I ended up creating a variety of ornaments by just tweaking the design here and there to fill up one of my trees. As always, thank you so much for stopping by today! I hope your weekend is off to a great start! I had the pleasure of hosting Make and Takes at the Pictures In Time Holiday Open House event this past Saturday. I had so much fun! I actually get very nervous at these events, but everyone was so friendly that I felt right at home. I hope you enjoy. And please, leave me a comment and let me know if this is something you'd like to see me do regularly or more often. 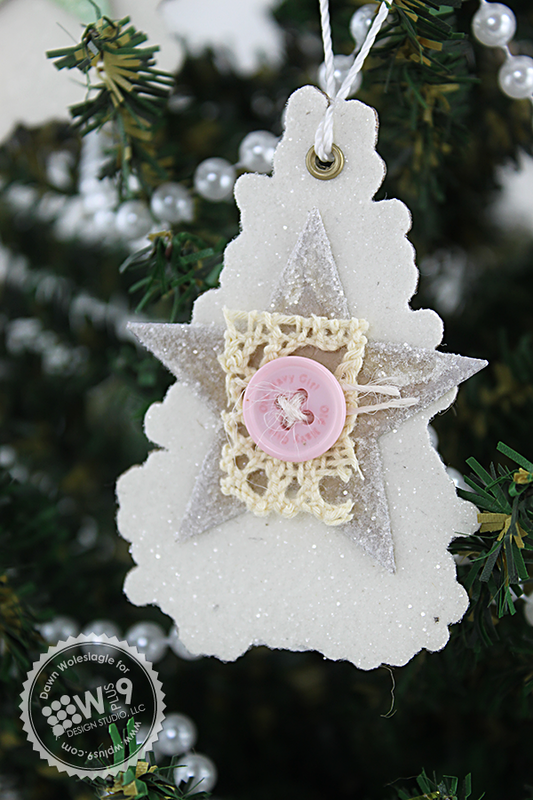 I will be back with a video tutorial on creating the glittered tree ornaments. So be sure to stop by again soon! Thanks for stopping by, I hope you all have a great day! Happy Election Day! I am so happy that this election is almost over. No more political phone calls! I don't know about you, but we have had non-stop political calls this campaign. Add to that, that my husband and I are registered with different political parties, and we get them from both sides! So.glad.it's.almost.over. OK, enough of my rant. I have a video and card to share with you today! I recently discovered the Be Creative Tape Sheets and can not get enough of them! I have a few projects and videos lined up to share with you over the next couple of weeks showing some of the reasons that I'm loving them. First up? 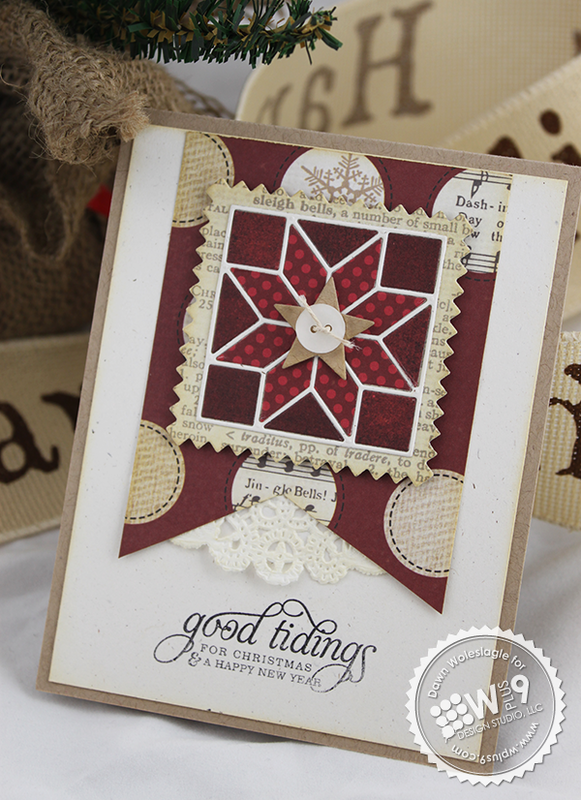 Quilt Cut dies and Be Creative Tape Sheets; The Perfect Pair! If you love the Quilt Cut dies, but want to cut your paper "quilting" time in half, this is the way to go! I picked up these tape sheets at my LSS, Pictures In Time. But I looked around and found them here, here, and here. Thank you so much for stopping by today, have a great one! If you follow us on Twitter or Facebook, then you know that shortly after the release my computer decided to die. I decided that instead of getting another PC, that I'd make the move to Apple. Switching also meant that I'd have to acquire all new software since I would be switching operating systems. I didn't realize that a couple of the programs that I currently use don't have Mac versions. After doing a little research, I settled on some alternatives and I am happy to announce that we are fully functional once again. My video editing software was one of the programs that I completely switched, so it took me a little while to get up to speed. But I finally finished editing part 2 of our Q&A video. We are excited to announce that we have many new retailers now carrying Wplus9 products, including Ellen Hutson! Onlinecardclasses.com is having a Holiday Card Workshop. You'll be able to find some great cards, amazing ideas and wonderful designers including our own design team member Cristina Kowalczyk. Sign up and you'll be able to pick up featured Wplus9 supplies and more at a discount from the class sponsors; Ellen Hutson and Simon Says Stamp! I will be doing Make and Takes at the Pictures In Time Open House event on Saturday November, 10th from 12-2. If you are in the Jacksonville/Orange Park/Fleming Island area and would like to stop by, I'd love to meet you! We have a large shipment of dies and stamps expected to ship on November 6th. We apologize for the delay on the stamps, but our manufacturer has increased their expected production times from 2-3 weeks to 3-5 weeks. We have made adjustments on our end to accommodate these longer production times and should see things even out by December. I wanted to thank all of you for the overwhelming response to our October release! We didn't anticipate it and we apologize for the quick sell out of so many items. Starting with our December release we will be opening up wholesale pre-orders even earlier so that we can get restocks in house sooner. We have also doubled our starting inventories again for the December release and we hope that these steps will help with availability. As always, thanks for stopping by today! I hope you are having a fantastic week!